What a weekend it was for collegians at the USATF Outdoor Championships. 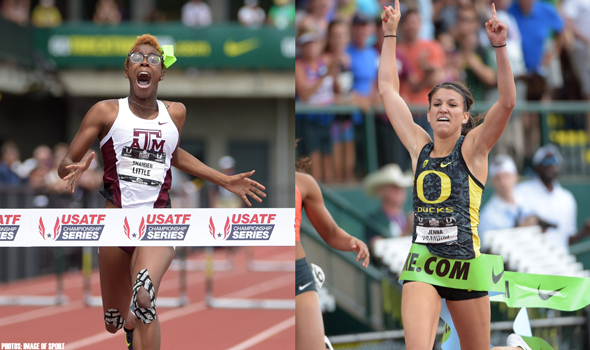 Shamier Little of Texas A&M and Jenna Prandini of Oregon won national titles Sunday at historic Hayward Field to headline six IAAF World Championships berths clinched by 2015 NCAA athletes on the day. Beijing will be host of those World Championships on August 22-30. Little’s title came in the 400-meter hurdles – an event in which she’s won two consecutive NCAA titles – while Prandini’s came at 200, an event in which she has been narrowly denied NCAA titles over the course of the past two seasons. From Sunday’s action, they’re joined on Team USA as collegians by pole vault runner-up Sandi Morris of Arkansas, and third-place efforts from pole vaulter Demi Payne of Stephen F. Austin, heptathlete Erica Bougard of Mississippi State and triple jumper Marquis Dendy of Florida. Dendy is now a two-time qualifier dating back to his long jump national title on Thursday. Bougard is also a second-time qualifier, having made Team USA in the heptathlon back in 2013. Those six athletes contributed to an overall collegiate haul that totals 17 individual IAAF World Championships qualifiers in 19 events, plus three more who qualified for relay pools and another four who are in the IAAF qualifying standard-chasing process. Here’s a rundown of how each of those collegians joined Team USA on Sunday. Two weeks ago Little – just over 20 years of age – became the youngest woman in the history of the world to break the 54-seond barrier in this event en route to winning the NCAA title. She broke 54 seconds again today, running 53.83 to add a USATF title to her two NCAA crowns. Her signature late-race surge worked to perfection once again, as she cleared runner-up Cassandra Tate by nearly two-tenths of a second. She now owns the top two times in the world in 2015, including her world-leading 53.74 from the NCAA Championships. No other woman has yet broken 54 seconds this season. Prior to Sunday, Prandini hadn’t had much good luck in big-time 200-meter finals of late. She missed out on the 2014 NCAA outdoor title by seven-thousandths (.007) of a second. Indoors this year, she ran the fastest time by a collegian in 2015, but it came in the prelims; she would finish runner-up to Kyra Jefferson of Florida. Just two weeks ago, she ran the fourth-fastest time ever posted by a collegian during the NCAA season at 22.21, but lost out to Kentucky’s Dezerea Bryant in 22.18. That all changed on Saturday, as she went 22.20 (+0.4m/s wind) to beat runner-up Candyce McGrone by nearly two-tenths of a second. Bryant and Jefferson were fifth and sixth, respectively. That time for Prandini is the seventh-fastest ever run by a collegian in legal wind, during or after the NCAA season. Prandini will go to Beijing as an individual qualifier at 200 meters and as a member of the 4×100 relay pool after finishing sixth at 100 meters on Friday. Her teammate Jasmine Todd will be going individually in the 100 and long jump, as well as part of the relay pool. After dominating the NCAA in 2015, Morris and Payne are taking the Year of the Vault to Beijing. Indoor NCAA champ/outdoor collegiate record holder Morris finished as the USATF Outdoor runner-up at 15-3 (4.65m), while outdoor NCAA champ/indoor collegiate record holder Payne was third at 15-1 (4.60m). Payne was also the USATF indoor champion. Payne had an early scare, needing three attempts to clear 14-5.25 (4.40m), but was able to clear her final three heights on no more than two attempts each. Morris maintained a clean sheet through her first four heights, before finally recording a miss at 15-1 (4.60m). she was able to get over 15-3 (4.65m) – incidentally, the same mark that earned her runner-up honors to Payne at NCAAs two weeks ago – on her second try. After two misses at that height, Payne passed on to 15-5 (4.70m) – the height she cleared to win NCAAs two weeks ago – but was unsuccessful in her lone attempt at that bar. Jenn Suhr took the win. Florida has earned the "Jumps U" moniker it likes to use to describe its dominance in the horizontal jumps. Dendy finished third in the triple jump with a leap of 56-6.5 (17.23m) to round out a Gator 1-2-3 sweep behind former NCAA champions Omar Craddock and Will Claye. Joining them in Beijing will be a fourth Gator in Christian Taylor, who earned an automatic bye to Worlds as the reigning World Champion. Dendy clinched his second berth of the weekend – he’s also going as the American long jump champ – with his fifth-round leap, though his fourth-round effort of 55-11.25 (17.05m) would also have been enough to get him through. Bougard cut it awfully close in the heptathlon-finale 800 meters, but nevertheless she’ll be donning the red, white and blue at the World Championships for the second time in her career (she also went in 2013). The Bulldog, who still has one outdoor season of eligibility at MSU remaining, finished third with 6288 points – just 14 clear of fourth-place Heather Miller-Koch. Running in step with one another for much of the 800, Miller-Koch made a move on the final turn that Bougard could not match, but her career-best 2:08.39 was close enough to Miller-Koch’s 2:07.32 to hold her off in the final standings. She posted 1000+ point efforts in three events over the course of the two-day event, including back-to-back 1120-point and 1080-point finishes in the opening 100-meter hurdles and high jump, respectively. She closed day one with 1039 points in the 200 meters.